Writing in the Brixton Bugle earlier this month Mums for Lungs, the grassroots air pollution campaign said air pollution on the Brixon Road although better was still very bad. What they meant was that as of 18 January there were five breaches of the hourly limit set for nitrogen dioxide compared to 19 in the first five days of 2017. Under EU law only 18 such breaches are allowed each year. 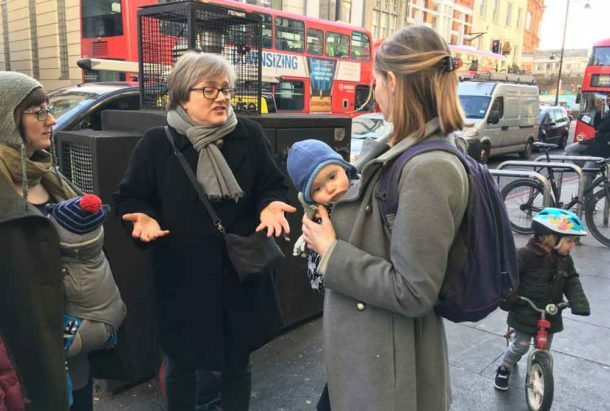 However this morning ( 2018) 30 January, when Mums for Lungs campaigners met with Green Assembly member Caroline Russell yet again the heavily congested Brixton Road had taken the dubious honour of being the first road in London to breach annual air pollution limits in 2018 – for the second year running. Russell said: “Only this morning I met with mums on Brixton Road who are extremely worried about what growing up in a high pollution area is doing to their children’s health. They told me their toddlers are coughing far too much. 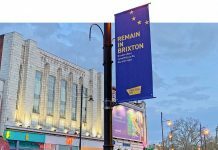 Earlier in the month Mums for Lungs had said: “We watched, slightly perplexed, as a number of internet tools designed to track pollution levels showed what appeared to be a slow start to the year’s build-up of bad air in Brixton. “Speaking with a number of experts who monitor air pollution in Lambeth – some of the worst in London – there appears to be several explanations for this year’s figures. “First, there was the windy weather in the week after New Year’s Day which helped to disburse the toxic pollutants. “Secondly, the new low emission bus zone (LEBZ) through Brixton to Streatham Hill was launched by London mayor Sadiq Khan in December. “Of course we are pleased that Brixton’s air is that little bit better this year as we push our babies around in prams. We are pleased that measures such as the LEBZ seem to be having an impact. “But much more needs to be done. “Although the news on the hourly nitrogen dioxide (NO2) limits is better, the annual mean for NO2 for Brixton Road is terrible. “A monitor located right outside Mothercare on Brixton Road reveals that the annual mean currently stands at 85ug/m3 – that’s micrograms (one millionth of a gram) per cubic metre. This is more than double the limit set by EU law (40ug/m3), and only slightly better than the 96ug/m3 average for 2017. “Although the mayor’s office was claiming credit for the “best air quality in London in ten years” we fail to see what the difference really is. Brixton’s air is still twice as bad as it should be. “We’re calling on candidates in Lambeth’s upcoming local elections (on Thursday 3 May) to pledge to make air pollution a priority. “We’re also encouraging anyone concerned about air quality to complete TFL’s public consultation on the plans for extending London’s ultra low emission zone (ULEZ) on the website. The consultation closes on 28 February.